Triglyceride Reduction TGs Formula | Advanced Blood Lipid Support - Full of Health Inc.
Hello, I’m Andrew Mierzejewski, a registered holistic nutritionist with over ten years' experience in assisting people with blood lipid and circulatory health concerns. While working with my clients, I tried numerous programs, health regiments, and lipid-controlling dietary supplements. Even so, I still kept getting mixed results. Frustrated, but not discouraged, I decided to develop an exclusive triglyceride reduction program based on my personal experience, observations, working knowledge, and nutritional research. It was a tough -- this is a very competitive and controversial field, to say the least -- but absolutely rewarding process. I kept on experimenting and perfecting "The Mierzejewski Formula" until it started to deliver REAL results. 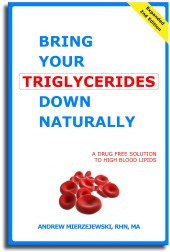 My quest for a foolproof solution to high triglycerides also resulted in the proprietary Triglyceride Reduction TGs Formula ("TGs" stands for triglycerides) which turned out to be truly effective in lowering elevated blood lipids. 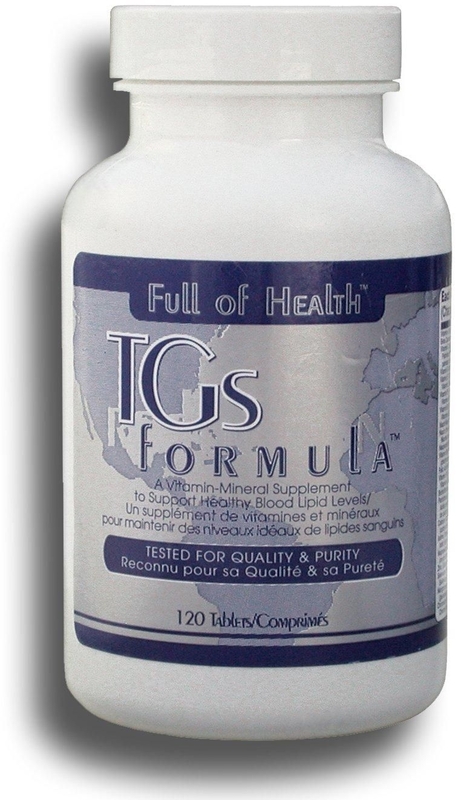 Over the years, I have received numerous complimentary letters from satisfied users of TGs Formula. On this page, I would like to share with you some of them. Such an overwhelmingly positive response to my work means more to me then I could possibly express in words. I thank all who have given or will be giving the TGs Formula an honest try. And for expressing your confidence in this - I'm proud to say - unique nutritional supplement truly effective in optimizing blood lipid levels. I am 50 years young and healthy -- I thought. What a surprise when my doctor called me with the results of a routine blood test. "You are a walking time bomb," he said. "I am calling in a prescription for Crestor. Go get it and take one right now." I did what he said, but I have never been one to take prescription drugs, especially those with side effects. I took only ten pills. I was so happy to find www.reducetriglycerides.com ! I ordered Bring Your Triglycerides Down Naturally, the Cookbook, and two bottles of the TGs. I read the book. I began walking (fast) 60 min. every day. I changed my diet completely. I used the book as a guideline to form my new eating habits and meal plans. I took 3 TGs per day. WOW !! How great is the TGs Formula !! Thank you Andrew !! Thank you so much !! P.S. When I read the testimonials on this website I was a bit skeptical. One guy stated that he would be taking the TGs for the rest of his life. Now I am saying the same thing. I will take the TGs for the rest of my life ! If you knew the solution to reducing your spouse's or best friend's risk of a heart attack or stroke without the need for drugs - wouldn't you want to tell the world? Of course you would! And so do I. However, according to the National Academy of Sciences, it could take years for natural supplements to reach mainstream doctors and hospitals. It could also take endless years for the National Institutes of Health in Washington D.C., to complete their testing process and confirm what nutritionists have known for years: Dietary supplements do work in supporting healthy blood triglyceride levels. I am not saying there's a conspiracy. It's just how the medical system works. The main and foremost goal of the nutritional approach to elevated blood triglycerides is to improve or restore the impaired sugar and/or fat metabolism in the body. It appears that people with high triglycerides do benefit from dietary supplements. There have been medical studies on the beneficial effect of nutritional supplementation on plasma triglyceride levels. If you choose to take a drug to 'solve' the underlying reason as to why your body is making too much triglycerides, than well over 95 percent of the time you will be making a choice that will promote disease rather than your health. carbohydrates, especially refined sugars, processed grains and starches. Along with lowering high blood triglyceride levels and increasing HDL-"good" cholesterol levels, Triglyceride Reduction Formula™ demonstrates the ability to reduce elevated levels of Lipoprotein (a) and LDL-"bad" cholesterol. It has been also proven effective in controlling the complications of diabetes, as many of the nutritional strategies to optimize serum (blood) lipids also contribute to glycemic control in patients with diabetes mellitus. Triglyceride Reduction TGs Formula represents the nutritional strategy for control of the metabolic abnormalities through the use of naturally occurring, non-toxic nutrients that normalize plasma lipids. With no doubt, as a complete food supplement, it can be of great benefit to you. By giving Triglyceride Reduction TGs Formula a try, you've got nothing to lose but - your dependence on the "pill-and-scalpel" mainstream! It is estimated that about 47 million U.S. adults have the metabolic syndrome X. As you know, hypertriglyceridemia - together with abdominal obesity, insulin resistance, and hypertension - is the key symptom of the metabolic syndrome which has become increasingly common in the United States. Because the metabolic syndrome is closely associated with insulin resistance, in which the body can’t use insulin efficiently, it is is also called the insulin resistance syndrome. Although not a cause of high blood triglycerides, metabolic syndrome is closely associated with hypertriglyceridemia. prevention of weight gain (by improving transportation of the body's leptin into the brain - a hormone secreted by fat cells which is reponsible for regulating appetite and energy expenditure, and for controlling weight). It is believed that the connection between being overweight and the development of type 2 diabetes might be found in the ratio of antioxidants to free radicals. preventing the formation of arterial atheromatous plaque - artery-clogging deposits causing heart attacks and strokes. Thanks to its plasma triglyceride-lowering properties, Triglyceride Reduction TGs Formula also works as a natural vasodilator; it helps the blood vessels to become wider by improving the function of vascular smooth muscle in the arterial walls, thus making them less susceptible to atherosclerosis. Our Triglyceride Reduction TGs Formula provides optimal concentrations of vitamins, anti-oxidants, lipotropic factors, chelated minerals, trace minerals, and digestive enzymes as they are all necessary to bring the triglycerides down to normal. A complete "all-in-one" multivitamin-mineral-botanical complex supporting healthy blood triglyceride levels. nutrients supporting bile flow and the healthy liver function, such as ox bile and L-Cysteine. I just finished my first order of TGs Formula and I'm impressed with the results. I took a nuclear stress test yesterday and the pictures of my healthy heart looked better than the poster in the doctor's office! I am a 55-year-old female, Type II diabetic with somewhat poor eating habits, overweight and not much of an exerciser. My doctor was impressed and found the pictures hard to believe. My HDL and LDL are in perfect range now and I think the TGs Formula had something to do with it. It's the only thing different in my regimen of supplements. Due to the outbreak of bovine spongiforn encephalopathy (BSE), also known as Mad Cow disease, some of you may have concerns with the glandular concentrates. We hope that the following information will help you feel confident of the quality of the adrenal, liver and pancreas concentrates used in our Triglyceride Reduction TGs Formula. In most people, Triglyceride Reduction TGs Formula can help bring elevated triglycerides down to healthy levels just in 2 - 3 months. Our clinical experience has shown that by taking the Triglyceride Reduction TGs Formula daily, you can lower your elevated blood triglyceride level down by 80 percent, based on client- and customer-reported results. We strongly encourage you to monitor your progress. Are you really doing what it takes to lower your level of triglycerides or are you just playing around? Have your blood test done before you start taking our Triglyceride Reduction TGs Formula, and then a month or, preferably, two months later check your blood triglycerides again. This is the best way to measure your progress in bringing them down to healthy levels. I did what he said, but I have never been one to take prescriptions, especially those with side effects. I took only ten pills. We are sure you will join them. Sooner, rather than later... This all-natural combination of seventy-three (73) nutrients and phytonutrients (plant nutrients) not only keeps your blood fats in check (as drugs do), but actually helps your body rebuild the organs and systems that control your blood lipids - without side effects. Prior to taking this Triglyceride Reduction TGs supplement, my former triglycerides were over 500 [mg/dl]. Following 3 weeks of taking this supplement only, my triglycerides were under 300 [mg/dL]. I just ordered another bottle, the book Bring Your Triglycerides Down Naturally and the Stretching DVD. I went and got the test today and the result was that my triglyceride level is now 123mg/dL down from 500mg/dL. (…) AND I ONLY TOOK THE TGs FORMULA FOR TEN DAYS. And as you know, I changed my diet, went running and also did a lot of stretching for about a month. I will continue my lifestyle changes and taking your Formula. I actually want to get my level down to 80 or lower. So I'm going to get another test in one month. Do you think that I should reduce the amount of tablets to just two a day from now on? Hope to hear from you ASAP. Thank you so much for producing a Formula that really works. The testimonial above has been presented as a true story. However, it has not been reviewed by Full of Health, Inc. and is the opinion of the listed individual. I just wanted to let you know about my results. I am a 44 year old male, 5-10 175 lbs. currently. About 1 year ago my triglycerides were at 475 [mg/dL] and my cholesterol was 275 [mg/dL] after taking an insurance exam. I weighed about 190 lbs. I hadn’t checked my levels for about 10 years, so I was shocked. I tried to reduce my levels with diet and I did get my cholesterol down to 257 but my tri’s were still 375. The doctor put me on Lipitor 40 mgs and after taking it for about a month I couldn’t stand the effects it had on me. My next exam after 45 days was 205 on my cholesterol which was good but my tri’s were still 325. The doctor wanted me to keep taking the Lipitor, but instead I ordered your natural formula. After taking 1 bottle [of Triglyceride Reduction Formula] over about 6-7 weeks and watching my diet closely, my results today were 194 on my cholesterol but my tri’s were 105!!! I was ecstatic. The doctor couldn’t believe it when I told him I did it naturally, and he wanted to see the formula. He was totally shocked. THIS WORKS, and I can’t tell you how much better I feel now by eating correctly also. P.S. I really believe in the naturopathic method of healing vs. all these drugs doctors are prescribing. I’m going to get my mom and dad taking this stuff and in my job I meet with a lot of people who are seniors who could use this. Are there any distributor opportunities available? Nevertheless, I’m thankful for the results I’ve had because of your product. In fact have anyone e-mail me and I’ll be glad to tell them my story, to help you spread the word about your fantastic product. * The testimonial above has been presented as a true story. However, it has not been reviewed and is the sole opinion of the listed individual. It was a pleasure speaking with you earlier. I really enjoy your product [Triglyceride Reduction Formula]. I have had excellent results for the first 3 months I used it. It took me from a blood test result of 2000 [mg/dl] to 179 [mg/dl]. As we've seen many times with various therapies, one size rarely fits all. And the same is true with nutritional, vitamin-mineral supplements. In many cases, the lack of expected results is a result of not getting enough of what should help correct a condition when you simply follow the directions for suggested dosages as shown on the label. Nutrient supplementation, to be effective, is very often a dose-related phenomenon. If you want to prove that vitamins do NOT work, simply take a garden variety 100% RDA type hard pill multi-vitamin. The dosage contained is so low (except for iron) that it is usually impossible to even detect in the blood that you ever took anything (even if the pill breaks down, which is not a given at all). Triglyceride Reduction TGs Formula consists of nutrients that are usually under-supplied in people with elevated blood lipids. As a strong "multi" with additional agents, it makes the powerful nutritional 'team' for the best potential response. However, in order to be effective, the dosage of the Triglyceride Reduction TGs Formula should reflect one's actual needs. As a rule, a person with higher level of blood triglycerides requires a higher amount of nutrients to experience the same level of 'health insurance' or therapeutic efficacy as a person with lower triglycerides (not to mention other factors involved). Therefore, depending on your actual triglyceride level, you need to vary the dose of the Triglyceride Reduction TGs Formula. For best results, you should adjust your intake according to your current blood test results. If your triglycerides level is between 150 mg/dL and 199 mg/dL, or 1.7–2.3 mmol/L ("borderline-high") - for best results, you should be on the TGs Formula for at least 1 month, taking two (2) tablets twice daily with substantial meals. Therefore, you would need one (1) bottle of the Triglyceride Reduction TGs Formula. If your triglycerides level is between 200 mg/dL and 499 mg/dL, or 2.3–5.6 mmol/L ("high") - for best results, you should be on the TGs Formula for at least 2 consecutive months, taking two (2) tablets twice daily with substantial meals. Therefore, you would need two (2) bottles of the Triglyceride Reduction TGs Formula. If your triglycerides level is higher than 500 mg/dL, or >5.6 mmol/L ("very high") - for best results, you should be on the Triglyceride Reduction TGs Formula for at least 3 consecutive months, taking two (2) tablets twice daily with substantial meals. Therefore, you would need three (3) bottles of the Triglyceride Reduction TGs Formula. I’d like to share a small success with you. Back in April my triglycerides were 1350 [mg/dL, or 15.4 mmol/L]. Two weeks ago [in September] I had another blood test done and they have come down to 379 [mg/dL, or 4.3 mmol/L] ! I think that's pretty good for just taking 2 bottles of TGs Formula ! I'm sure that by continuing your program my triglyceride level will continue going down. Thanks so much for improving my health! My father always had to take medicine to reduce his triglycerides levels, but, as soon as he stops taking these drugs, everything turns the same. Our concern is that these drugs are not natural, as your Triglycerides Reduction Formula, which he is taking for 3 months with great results!!! According to your Suggested Intake, for his triglycerides levels (over 500 mg/dL), he took, for three (3) consecutive months, two tablets twice daily. Now, we don´t know if we should reduce the intake, as his levels came to normal, just to maintain them at normal rates. If you could suggest us how to proceed, it would be great! reduce your daily intake to a maintenance dosage of just two (2) tablets a day. If you decide to stay on Triglyceride Reduction TGs Formula we recommend taking one (1) tablet in the morning with your breakfast, and another one in the afternoon or evening, with your dinner or supper, for as long as you feel it's necessary. This dosage, however, reflecting our research and clinical experience, is not inflexible. The golden rule is that you listen to what your body is telling you. For example, you may find - for various reasons, such as metabolism - the suggested maintenance dosage is too low, and that you have to keep to a higher one - three (3), four (4) or even more tablets of the TGs Formula daily. Just experiment. Test the various dosages to see what intake best helps you maintain your optimal blood lipid levels. But, if your blood triglycerides tend to go up again, you will need to increase your daily intake of the TGs Formula for at least one more month. And then cut it back to the maintenance dosage (two tablets per day), keeping in mind the importance of your everyday food choices and lifestyle. No matter what has prompted you to visit us, we’re confident you have found the information you needed and, consequently, will be able to take full advantage of the products we offer. When it comes to multinutrient supplements, you should consider taking solely those which can meet your specific health needs such as Triglyceride Reduction TGs Formula designed for people with abnormal blood levels of triglycerides and other lipids. Our Triglyceride Reduction TGs Formula consists only of well-researched and carefully selected nutrients and phytonutrients working in unison by complementing each other. Most of them are provided in mid-to-high range levels; they ensure more than just RDA levels -- but not at potentially excessive or "super-mega" levels. So when using the TGs Formula you do not need to fear of “overdosing” or “wasting” money - a common experience for consumers faced with choosing nutritional products. On average, by taking Triglyceride Reduction TGs Formula, you can get your triglycerides down to normal, safer levels in two to three months. Hundreds of thousands of people have found the Triglyceride Reduction TGs Formula that you are now reading about effective in lowering their blood triglycerides. If it has proven to be that successful, surely you owe it to yourself to give this Formula every chance to work for you too. Try it! Don't question it. Do it. It you don't, then if you don't get decired results you will never know if your failure lies with the Triglyceride Reduction TGs Formula or - with you. Hundreds of thousands of people have found the Triglyceride Reduction TGs Formula effective in lowering blood triglycerides. If you don't try it, then if you don't get desired results you may never know if your failure lies with the Triglyceride Reduction TGs Formula or - with you. Testimonial: "I'm Astonished by the Results!" I just spoke to one of your representatives on the telephone as I had promised I would do after seeing my doctor with the results of my blood test and my high triglycerides level. I had originally planned to see the doctor after 1 month of taking the Triglycerides Reduction Formula but could not do so because of my heavy work schedule. Consequently, I continued taking the formula for another 3 months. My original triglyceride level was at 1000 [mg/dL]. Today, after taking the Formula with no other medication intended for high triglycerides, the astonishing number of 130 was revealed in the blood test. My good cholesterol was perfect as well as my bad cholesterol. I think the fish oil took care of that. Since this surely beats taking medication for the problem, I highly recommend the Formula to anyone who gets the warning and the high triglycerides numbers. It, simply put, works. And I will now continue taking the Formula as long as you make it. Thanks very much. I couldn't be happier with this development. PLEASE NOTE: Our proprietary Triglyceride Reduction TGs Formula, a dietary supplement made in the United States (Pittsburgh, PA) at the FDA- and Health Canada-approved manufacturing plant, by all means is NOT A DRUG or prescription medicine; therefore, it can be ordered by all who want to bring their blood lipids down to healthy levels naturally. Currency: The price is quoted in US funds, when delivered in AND outside Continental USA. Based on client- and customer-reported results, in two to three months the Triglyceride Reduction TGs Formula may help lower high blood triglycerides by up to 80 percent - - depending on the severity of someone's condition, Why not give it an honest try? By clicking on any of the "add-to-shopping-cart" buttons, you are NOT obliged to purchase anything. Even if you complete a transaction, you can always CANCEL it by contacting us by e-mail or phone. Hitting your browser's "Back" button will take you to where you were before. enter your FULL NAME, then click on the "$" button below. PLEASE NOTE: The Loyalty Discount applies to qualified VirtualCART® orders only. Include your full name, shipping address, phone number, and your preferred method of payment. PLEASE NOTE: While you and others may find the Triglyceride Reduction TGs Formula helpful in lowering high blood triglycerides, you should talk to your doctor or naturopathic healthcare professional before beginning any natural or over-the-counter self-care treatments. TGs Formula: "This is Truly Amazing!" Last April, he had a blood workup and the results were: cholesterol - 193, triglyceride - 611, HDL - 31, LDL - 171. Then, on August 24, he had another test results: cholesterol - 194, triglyceride - 720, HDL - 27, LDL 181. Before he was on a diet for cholesterol taking a one-a-day vitamin, extra Vit. E 1,000 IU's, also a B complex, Guggulipid 2 a day, golden flax seed. When we received your Formula, he stopped everything except the guggulipid. required especially by the elderly who need larger amounts of supplements, because of their longer standing deficiencies and poor assimilation of all nutritional factors. As opposed to taking drugs, taking the Triglyceride Reduction TGs Formula is something you can do on your own - and get results. Multivitamin/mineral supplements are regularly taken by over one-third of American adults, equivalent to about 73 million people. It is impossible to judge the true quality of a product – especially a natural product – simply by reading a list of ingredients. Even experts experienced in nutritional technology cannot assess the value and quality of a product by merely reading a label. Factors such as freshness and freedom of contamination of the raw materials, just to name a few, are critical variables as well. Our proprietary Triglyceride Reduction TGs Formula is certified by a laboratory to meet the stringent testing outlined. This ensures that you receive the highest quality, contaminant-free dietary supplement. It has been known for a long time that prolonged stress plays a major role in increasing the blood levels of triglycerides. However, with regards to elevated blood lipids (fats) the stress factor has been repeatedly underestimated both by doctors and their patients. © 2001-2010 Reduce Triglycerides.com: Lowering High Triglycerides Naturally with Triglyceride Reduction TGs Formula: A Drug-Free Approach to Elevated Blood Triglycerides. All rights reserved worldwide. This document may not be copied in part or full without express written permission from the publisher. The information on lowering high triglycerides nutritionally provided herein is a general overview on this topic and may not apply to everyone, therefore, it should not be used for diagnosis or treatment of any medical condition. While reasonable effort has been made to ensure the accuracy of the information on reducing elevated triglycerides naturally, Full of Health, Inc. assumes no responsibility for errors or omissions, or for damages resulting from use of the high triglyceride information herein.